This is an easy, no-bake way to get healthy fats and protein on the go. Unlike many protein bars on the market, this #SuperSwap has no added sweetener. You can swap out the same amount of peanut butter + flax for: cashew butter + hemp seeds, almond butter + chia seeds, sun butter + sunflower seeds. 1) Stir and portion: In a small bowl, mix oats, peanut butter, flaxseed, sea salt, and vanilla (if using). The mixture will be super thick. 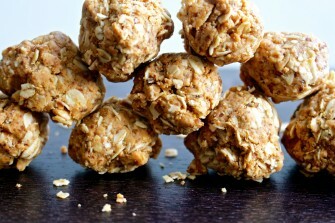 Portion it out into four tablespoon-size bites and roll each in your hands to form balls. 2) Store: Store in an airtight container in the fridge for up to 1 week. You can make extras and freeze them for up to three months. For taking these on the go, I love popping them into unbleached, paper sandwich bags. If you don’t have these bags, get them in health-food stores or online. 3) Flavorize: Change it up by adding 1/4 cup of healthy goodies such as raisins, unsweetened dried cherries, unsweetened coconut flakes, mini dark chocolate chips, or cocoa nibs. GF Swap: Use gluten-free oats or quinoa flakes. Wow! These are great, Ive been looking for a recipe like this for my 3PM slump when I want to snack on chips or chocolate. I recently made this recipe and added some chai spice blend I just ordered off of etsy… seriously, it made these energy balls of the top amazing! Are the rolled oats “quick” or regular or does it matter? Just regular old-fashion, rolled oats is what I use. Many times I will pulse 1/2 of the oats & leave the other half whole.